Keep your pads working for you and shining your boat! Polishing gel coat and marine surfaces is a nasty business. Oxidized gel coat and mineral stains will quickly reduce your polishing pad's performance. The Marine 31 Spray Polishing Pad Care Combo is designed to clean and restore your polishing pad's performance to make polishing much easier. By using the Marine 31 Spray Polishing Pad Care Combo you will prolong the life of your polishing pads and achieve better results, faster. Marine 31 Spray Polishing Pad Cleaner is the fast-acting solution for removing polish residues, abraded gel coat, oxidation, scale, lime, and wax from your polishing pads. Marine 31 Spray Polishing Pad Cleaner is designed to work fast so you have more time to enjoy the seas. Marine 31 Spray Polishing Pad Conditioner allows your polish to flow over the polishing pad surface more completely, reducing the amount of polish needed to prime the pad. Marine 31 Spray Polishing Pad Cleaner is formulated to clean the nasty gunk and sticky gel-coat residues from your polishing pads. Polishing a boat, RV, or watercraft contaminates your polishing pad and quickly reduces its performance. Marine 31 Spray Polishing Pad Cleaner goes to work quickly, loosening grip of contaminants on the foam or wool fibers so you can rinse them away. 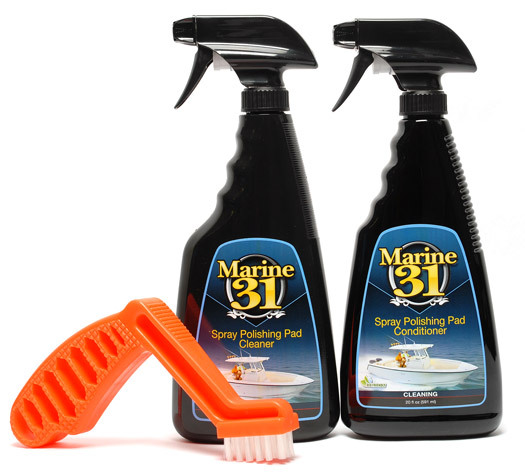 Like all Marine 31 products, Marine 31 Spray Polishing Pad Cleaner is eco-friendly and harbor-safe. The Foam Pad Conditioning Brush features tuned nylon bristles that agitate the surface of your foam, microfiber, or wool pads releasing any caked on polish residue. By removing polish residue frequently you will enjoy better polishing performance for a longer period. A Word from the Captain�s Chair: Polishing your boat will never be as fun, nor as relaxing, as piloting it on the open seas. The Marine 31 Spray Polishing Pad Care Combo increases your polishing performance, saving you time and letting you get back to what you love doing. Anchors up!